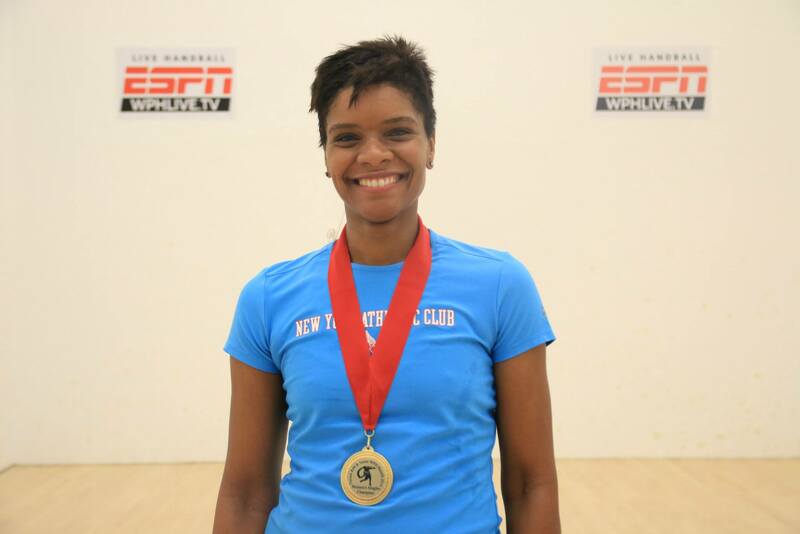 Tucson, AZ, WPH Press, 8/7/18- Tracy Davis is one of the most revered and respected handball superstars in the history of the sport, as Trey sets the bar for fitness, sportsmanship, and class. At 41 years old, Tracy continues to inspire the handball world with her dedication to her craft, her relentless pursuit of greatness, and her willingness to meet all challenges in all codes of the sport. Davis will face Ireland’s Aoife McCarthy in the first round of next week’s World Championships, with the winner to face All Ireland champion Martina McMahon in the quarterfinals. Looming in the bottom half of the draw is two-time defending world champion Aisling Reilly. The WPH had a chance to chat with WR48 #4 Tracy Davis about her preparation, her thoughts on the women’s field, how she is dealing with the pressure and more ahead of next week’s World Championships. Check out the conversation below! WPH: What does playing in the World Championships mean to you? Tracy: It means a lot more than I thought it would. I had all ready decided after the WPH Player’s Championship in May that I was taking the summer off from handball and here it is now and I’m training harder than I have in years. I’m really excited about playing this time around, especially with all the preparation involved. WPH: How have you prepared yourself for the upcoming World Championships? Tracy: I’ve consciously pushed myself outside of my comfort zone training in the gym, adding different routines and increasing strength training, and I’ve played a lot of tough singles matches against players who are significantly better skilled than I am to get more experience having to compete at a higher level on a more regular basis. I’ve found the combination of pushing myself in the gym and on the court has improved helped improve my confidence and competence on a 4-Wall court. WPH: This is likely the strongest draw in the history of the World Championships. How much does that inspire you? Tracy: It is quite inspirational to see the quality of players today continue and improve upon that legacy of athleticism, determination, and handball expertise that players like Anna Christoff, Lisa Fraser, Fiona Shannon, Rosemary Bellini, Anna Calderon and so many others began. I wish I had more time on my side to be a part of this new wave of competition. I’m very proud of what this generation of players has accomplished. WPH: How did you peak for the World Championships? Tracy: I’ve played in local tournaments in singles and doubles divisions to help prepare me for the tournament mindset. Also, as mentioned earlier, I’ve purposely sought out matches against players that I have to fight tooth and nail for each point. Surprisingly I’ve found that I can compete at that level, even to the point of having hard earned wins or come close to winning. Those matches have done a lot to help me dig in, stay focused and not give up even if the odds are against me. WPH: Do you feel added pressure playing in the once every three years World Championships? Tracy: Yes and no. Yes because in general I put pressure on myself to play my best and not have so much anxiety about it. And no because I’m not the one expected to win so it’s not that outside pressure, thankfully. WPH: How will your past World Championship experience help you next week? Tracy: Previous experience helps to keep things in perspective. I’ve experienced victory and crushing defeat at previous events. I didn’t think I’d play in this one and here I am. The experience helps me understand that I really need to focus on enjoying the moment because I won’t be able to do this much longer. WPH: Who do you see as the biggest threats to take the title in Minnesota? Tracy: Everyone playing is a threat. I assume that every one else playing has done their homework and their training. Of course there are standouts in the field who are bigger threats than other players but I’ve played almost everyone playing in Minnesota and I can attest that they are all ridiculously good. It’s a matter of trying to keep up with the opponent: how soon that can happen after the score is called as well as keeping that high level of play to the end. WPH: It’s possible that you could play Irish opponents with whom you’ve never played in Minnesota. How will seeing a player for the first time change your approach? Tracy: It won’t do much to change my approach. My plan is to start out strong and maintain that level of intensity throughout the match. One thing I have learned is to not underestimate anyone, regardless of her tournament experience.